Butter Bridge stands in the shadow of Beinn Ime and crosses the gently flowing Kinglas Water, in Glen Kinglas, Argyll. The bridge was built sometime between 1748-1750 and was part of Major Caulfeild’s military road that ran from Dumbarton to Inveraray. The construction of military roads, barracks and forts was initiated in 1725 by General George Wade, an Irishman, who was appointed ‘Chief of His Majesty’s forces, castles, forts and barracks in North Britain.‘ The need to improve the military infrastructure in Scotland came in the wake of the 1689, 1715 and 1719 Jacobite Risings. Roads and bridges were built to link the new barracks and forts with the lowlands and to facilitate the movement of Government troops, making the Scottish Highlands more accessible. Major William Caulfeild, also an Irishman, was employed by Wade in 1732 as Inspector of Roads and he took over the road building programme when Wade left Scotland in 1740. Although he is not as well known as Wade, Caulfeild oversaw the construction of over 800 miles of road and around 600 bridges, compared to Wade’s 250 miles and 40 bridges. Many people talk about ‘Wade’s Roads’, but it is important to note that most of the road network was done under Caulfeild. Both men had great respect for each other and it is believed that Caulfeild was the author of the verse: “If you had seen these roads before they were made, you would hold up your hands and bless General Wade”. In 1726, Colonel Henry Hawley wrote that keeping soldiers occupied in road building would “prevent sloth and idleness” and “twould keep them in good dicipline”. Hawley would later command the Government forces at the Battle of Falkirk in January 1746. 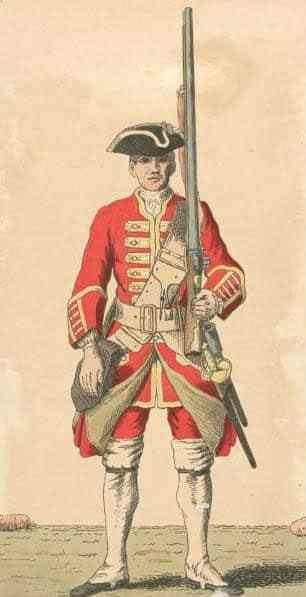 A soldier of Lascelles’ Regiment c.1745. The regiment was raised in Scotland in 1741. The construction of the Dumbarton to Inveraray road began in the summer of 1743 and by May 1745 had got as far as Luss, on the west bank of Loch Lomond, with work on this part carried out by men from Lascelles’ Regiment. A stone with the inscription ‘Colonel Lascelles Regiment, May 1745’ was placed three miles from Luss. Work was interrupted in August 1745 when Charles Edward Stuart landed in the highlands, beginning the 1745 Jacobite Rising. Road building was halted until after the Jacobite defeat at the Battle of Culloden in April 1746. In September 1746 the Scots Magazine reported that ‘a small detachment of soldiers under Major Caulfeild are begun to work on the roads of Argylleshire‘. The road up to Butter Bridge was completed in 1748 by parties from Ancrum’s Regiment (later the South Wales Borderers). The remaining twelve miles of road to Inveraray was finished in 1749. War Office records show that Thomas Clark, a mason from Dunkeld, built nine bridges during 1749 on the final twelve-mile stretch. It is possible he was involved in the construction of Butter Bridge. Butter Bridge is a humpbacked, single-arch bridge spanning the Kinglas Water. Built mainly of coursed rubble with better cut stone for the arch stonework. 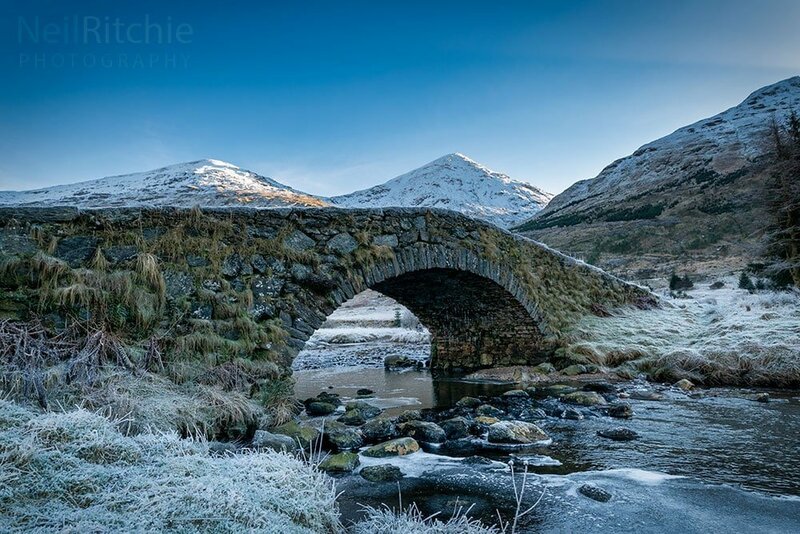 The bridge is just a short drive from the well-known ‘Rest and be Thankful’ on the A83 road. ‘Rest and be Thankful’ were the words inscribed on a stone erected by Ancrum’s Regiment to commemorate that section of the road’s completion. Although the roads were constructed by parties of soldiers, the bridges were built by civilian masons, and work on a bridge would still be continuing long after a stretch of road was already completed. In some cases, bridge building wouldn’t begin until after a road was finished. If no ford was available nearby, boats or a temporary wooden bridge were often placed on site until the bridge was ready for use. To build the military bridges, first, the river banks would be cleared to make way for a solid foundation. Then a wooden frame would be erected which would support an arch barrel. Once the keystones were in place the arch barrel and frame would be removed. A lime harling was then applied over the stonework as a protective coating. As with the roads, the stone required for the construction would usually be quarried locally. Bridge building was time-consuming and expensive. Some of the bridges had to be rebuilt after being washed away by fast-flowing torrents, likely due to poor foundation work. The name Butter Bridge comes from the tradition of bringing cattle high up into the glen in the summer months for pasture. It was the women who tended to the cattle and it was in this remote and picturesque spot the cattle would be milked. Butter and cheese would be produced in temporary dwellings.